In their inaugural season the Colorado Eagles have clinched their first playoff berth in the American Hockey League to face the Bakersfield Condors. 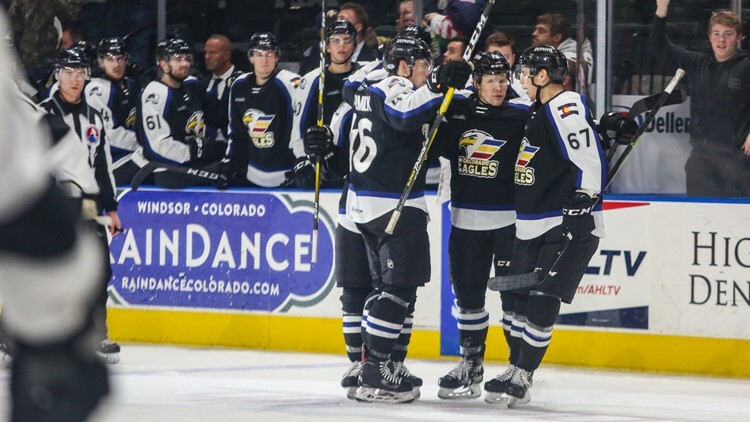 In their inaugural American Hockey League season, the Colorado Eagles have punched their ticket to the 2018-19 AHL Playoffs after defeating the San Jose Barracuda 3-2 on Saturday night. The Eagles' win in conjunction with San Diego's win over the Tucscon Roadrunners cemented the team's first playoff berth in their new league. The Eagles finished the regular season fourth in the Pacific Division with an overall record of 36-27-4-1. Although the franchise is coming off back-to-back ECHL Kelly Cup Championships, the team consists of many new faces from the Avalanche's former AHL affiliate the San Antonio Rampage and 2018 draft picks. There are only six players who have carried over from the Kelly Cup winning team last season (Travis Barron, Michael Joly, Jean-Christophe Beaudin, Julien Nantel, Nicholas Meloche and Nolan De Jong). Tickets for the first round of the Eagles/Condors series go on sale to the general public on Monday, April 15th at 10 a.m. MST. Tickets start as low as 20 dollars and can be purchased at the Budweiser Event Center box office, by calling the Eagles ticket staff at 970-686-SHOT (7468) or by visiting ColoradoEagles.com.